I’ve been home for 3 days now, and pretty much back in the swing of work, etc. Hard to believe I was in the footsteps of Mt. Everest a little over a week ago. Overall, had a great trip, it was everything I thought it would be and more. I really couldn’t blog from over there well, so I will try to fill you in over the next few days some of the events of the last month. The tragedy on the mountain really overshadowed everything on the last few days of my trip. Very sad to have that many lives cut short in an instant, and to be in that area when the worst day in the history of the mountain occurred and the events that unfolded afterwards was almost surreal. I will echo something Robert told me before I went over to Nepal. He said you’ll go for the adventure and mountains but what you’ll come home with is an appreciation of the people. I would agree that is exactly what happened. The scenery and mountains are obviously world class, amazing. But what is really impressive are the people of Nepal, and how tough, resilient, hardworking. yet happy despite what they don’t have. It has given me a better appreciation for what we have here, hopefully I can relate some of that to you in the next few days. After spending the past few days in Kathmandu, Scott is now on a plane heading back home. He is deeply saddened regarding the tragic circumstances in the Khumbu Ice Falls and is very sorry for the Sherpa people. Robert Kay and the other folks on the Altitude Junkies expedition will not be attempting their climb to the summit this year. Scott had a some very unique experiences in Kathmandu before he left…including some mountain biking. Go figure. He managed to leave a little extra room in his bag for his biking shoes. Always thinking. I want to thank all of my family and friends for the wonderful support while Scott was gone….I greatly appreciated the phone calls, texts, e-mails, and invitations. I am so blessed….thank you. I just got off the phone with Scott…hearing his voice for the first time in ten days was even sweeter given the tragic circumstances on Mt. Everest. He is in Monjo village and is one trekking day away from Lukla where he flew in via helicopter. They are showing it on the news in Nepalese and he said it is very solemn in the dining hall right now. Scott couldn’t say enough kind words about how wonderful the Sherpa people are. Such a tragedy. I am posting for Scott again as he hasn’t had internet access for quite some time. In addition to that, the phones haven’t been working and there were several days I didn’t hear from him. He called last night from the summit of Lobuche (20,000 ft.) using his Sherpa’s phone. He was quite emotional….they were up at 2AM so they would reach the summit at a decent time. He is doing great. He said that there is no fear of him ever climbing Mt. Everest….he said he couldn’t begin to fathom climbing two more miles higher! 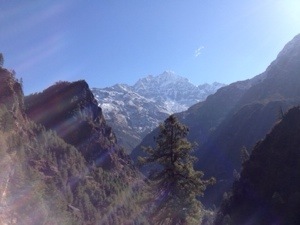 Everything from this point on will be mostly downhill to Lukla and then a helicopter ride to Kathmandu. Greetings from Lincoln Nebraska! This is Maggie…. Scott is having difficulty posting his blog at this time so I am helping the poor trekker out. 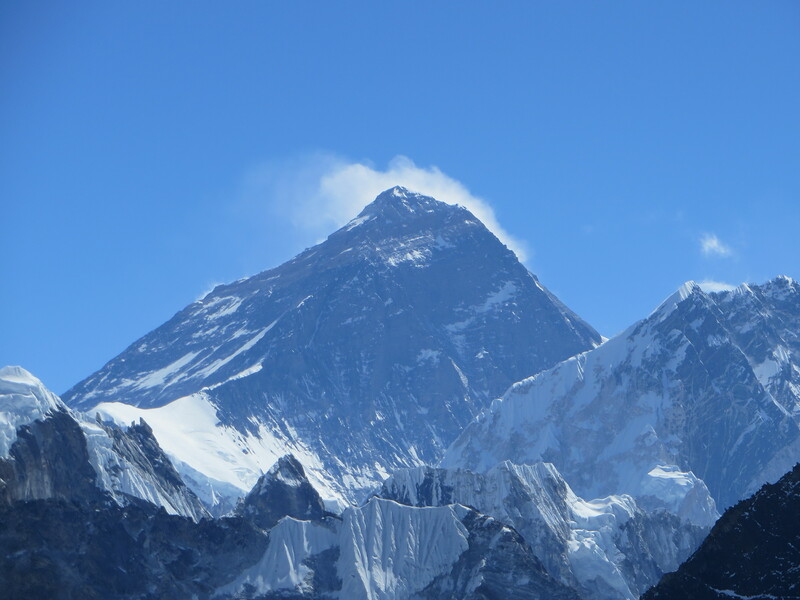 Tomorrow will be close to a ten hour trek over Cho La pass (about 18,000 ft) to Lobuche. Scott is hiring a porter to help him carry his stuff so he’s not constantly eating Robert’s dust/snow. Scott is hoping to blog from Lobuche since that village is on the main road up to base camp. He’s in great spirits and is dreaming of salads and grilled fish. That last post was written by me, Maggie, his best friend, his “if you want to be happy for the rest of your life” wife :)…. I am posting this on behalf of Scott. This is the view he has from his bedroom window at a lodge in Goyko where the going rate is $2 per night. Our first day of trekking was a pretty easy day, actually descending from lukla to pahkding. That’s overall descent, but a lot of up and down. We did weigh our packs and I won! The heaviest. The second closest was Louis who’s wife came along as a trekker and he is carrying all her stuff. She’s got the lightest pack. Weird. Robert’s was right in the mix as heaviest as well. 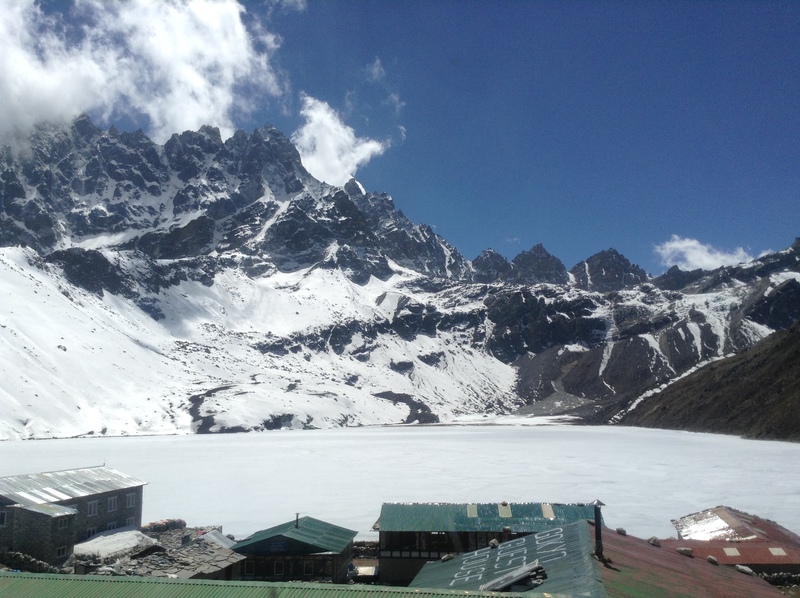 Robert and I have an excuse since we are trekking over to Gokyo and climbing Gokyo Ri and the cho la pass and may need more stuff for that. At least that’s our excuse. Anyway, saw my first yak and of course snapped a photo. A thousand yaks later and ten thousand yak dung piles along the trail and I was not so impressed. What is impressive are the Sherpa people. There are lots of Sherpa porters along the way ages about 10 to 70. Saw a guy about 70 carrying 3 boxes total weight 62 kg (it’s written on the boxes, that’s how they pay them, by the kg) walking in flip-flops! That’s about 137 lbs, I’m sure more than he weighed. Many other examples like that just make you shake your head in amazement. Scenery was amazing, Himalayas are so big, pictures can’t do it justice. Stayed at Dorje Sherpa’s lodge, had yak steak for dinner, didn’t mind eating one of them after dodging their dung piles all day. Dammit Jim I’m a doctor not a carpenter! Day 2 trekking is from Phakding to Namche. We climbed from about 8000′ to 11,000′ mostly in the last bit. Got our first view of Everest, kind of, along the way. It may have been covered in clouds. But here is a picture. The end of the trek had some excitement. Louis, mentioned previously, had developed some severe diarrhea overnite (possibly from carrying all his wife’s makeup the day before) but set out any way. He did ok until getting to the Namche hill. Then he was really struggling, could hardly walk. And this is a man who has summited Everest. Robert and I helped him by short roping him, one of us pulling and the other pushing from behind. 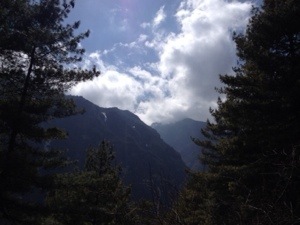 He’s still struggling and we’re a ways from Namche and a ways from the previous village. We try to negotiate a yak ride for him but that was a no go. Then I thought that maybe some dexamethasone that I had brought in case of someone(mainly me) got high altitude pulmonary edema might give him a boost to help get to Namche and rest. But since I wasn’t sure that was a good idea I called the ER docs at Bryan and explained the situation. (Used a cellphone I had bought in Kathmandu for $20 and calls to USA are about 2 cents/ minute) They thought it couldn’t hurt so I got out the dex and gave him an injection. It actually worked, perked him up after about 10 minutes and we made it up the hill to Namche. Pretty amazing, calling half way around the world for medical advice in a third world country! Anyway, by the time we went to an Irish pub for a pint (no Guiness) the climbers had started making fun of the whole situation. Keep it in perspective these are guys that have survived avalanches, rescued climbers above 26,000 ft. by giving them their own oxygen, seen their friends die, fallen in crevasses and survived, and other amazing stories to numerous to mention. So a trekker with diarrhea at 10,000 is not a big deal. The joke was that you better not complain to the good doctor about anything, a hangnail, a bunion, slight headache, or he’ll come at you with his needle and syringe full of dex! Good thing I didn’t tell them about how I helped get Maggie through her half marathon last year, but that’s a story for another time.